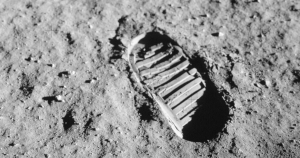 "There is no law against running over the first bootprints imprinted on the moon." Right now, there’s no legal framework preventing people from destroying or selling culturally-important landmarks in space. For instance, as space travel becomes more common, an opportunistic someone could find a way to steal and auction off the first bootprints left on the moon by Neil Armstrong, warns University of Mississippi Air and Space Law professor Michelle Hanlon in an essay published Friday in The Conversation. Hanlon cites damage to landmarks like the Pyramids of Gaza or Terracotta Army by tourists who break off pieces to take home as evidence that people can’t be trusted to preserve landmarks of their own volition. Places like Stonehenge and ancient cave paintings are protected as part of the U.N.’s World Heritage List. If landmarks in space are to survive as more nations and companies develop the capacity to leave the planet, Hanlon believes that leaders need to be proactive and protect those landmarks before anything goes wrong. Hanlon is just one of many to recently call for more comprehensive or updated space laws. Right now, the various laws and treaties that pertain to outer space are a bit of a mess. Hopefully, before trips to the moon become commonplace, someone can sort them out.